It’s been more than two years since I last wrote about Shell. At the time, the company had just completed a controversial buyout of BG Group, and uncertainty about the health of Shell’s balance sheet, the safety of Shell’s dividend and the ability for Shell to navigate the oil market downturn were weighing heavy on the stock. Fast forward 28 months later, and Shell has proven that none of these concerns were warranted. In fact, Shell recently reported $14.7 billion in cash flow from operations, it’s highest quarterly total since Brent crude oil was priced at $120/bbl back in Q2 of 2008. Shell took a lot of heat for its $53 billion buyout of BG Group in 2016, a deal that pushed its debt to about $80 billion. However, the company assured shareholders at the time that it planned to address its debt by divesting $30 billion in assets by the end of 2018. Sure enough, as of Q3, Shell said it has completed $28 billion in divestments to date and has announced another $4 billion in divestments, including a recent $1.9 billion deal for Denmark Upstream. Shell intends to continue divesting more than $5 billion in underperforming assets in 2019 and 2020 as well. At the same time Shell is dumping its worst assets, the BG Group acquisition helped the company more than double its free cash flow in the third quarter from $3.6 billion to $8 billion. As a result, Shell’s net debt has shrunk from $77.8 billion in Q3 of 2016 to just $60.5 billion in Q3 2018. While the BG Group buyout certainly stretched the balance sheet thin at the time, Shell has demonstrated it is executing its long-term debt management plan and using the BG Group acquisition to upgrade its asset portfolio. As it turns out, concerns about Shell’s world-class dividend were also unfounded. 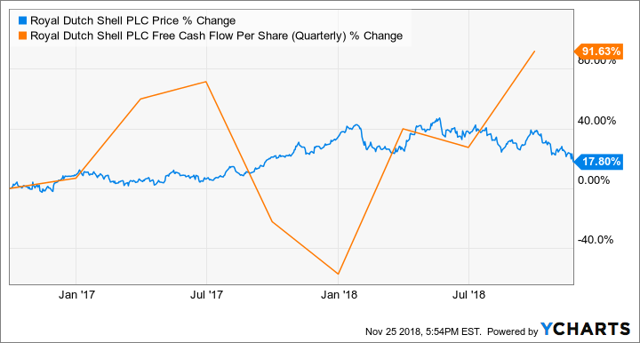 Not only has the company continued to pay its 94-cent quarterly dividend, its cash flow has been sufficient to launch a $25 billion share buyback program in July. 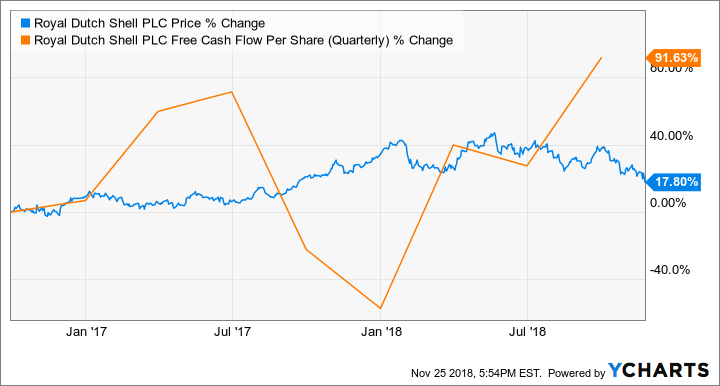 In the most recent quarter, Shell’s $8 billion in free cash flow were enough to cover both its $2 billion in share buybacks and its $1.8 billion dividend with more than half ($4.2 billion) left over. Shell’s 5.9 percent dividend yield would easily rank among the highest 15 dividend yields in the entire S&P 500, even though few of the stocks with higher yields have a payout ratio below 50 percent like Shell. And for U.S. oil major investors, Shell’s 5.9 percent yield easily beats out the 4.1 percent yield of Exxon Mobil Corporation (XOM) and the 3.7 percent yield of Chevron Corporation (CVX). The oil market has certainly stabilized in the past two years. While it remains relatively volatile, oil prices are well above the $40/bbl level they were trading at in mid-2016. Volatility is likely not going away anytime soon, but the consensus opinion is that oil prices will generally drift higher in the next few years. For example, Bank of America is calling for $70/bbl WTI crude prices by 2020, roughly 25 percent higher from recent prices. Unfortunately, all oil stock investors must face one major headwind: investor sentiment. A certain percentage of investors see fossil fuel as a dying industry and are avoiding oil stocks no matter how good their fundamentals may be. In reality, despite major advancements in renewable energy, Wood Mackenzie is predicting global oil demand will not peak until 2036, roughly two decades from now. Think about that for a second. Not only is global oil demand not dropping, it will continue to rise for another 18 years. Sure, alternative energy is the future, but oil demand is only growing larger as massive emerging markets like China and India mature.